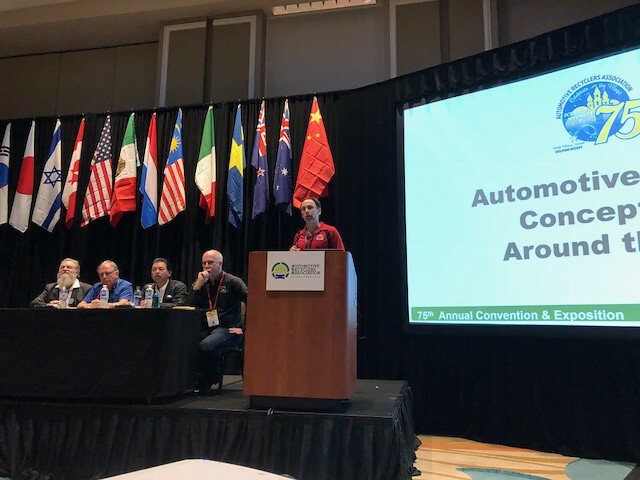 Orlando, Florida -- November 7, 2018 -- The 75th Automotive Recyclers Association annual convention & trade show saw an invasion of Canadian auto recyclers helping to advance the global auto recycling industry. From suppliers like Cliff Hope from PMR Catalyst, Philippe Clermont from Power-DB and Henk Huijgen from ELV Select/SEDA, to Board Members Dalbert Livingstone from Island Auto. Supply, Ed MacDonald at Maritime Auto Parts and ARA President David Gold of Standard Auto Wreckers, the Canadians seemed to have been everywhere. While in the past, the ARA convention’s content may have tended to focus on the American market, this convention had a distinctly global flavor—an initiative largely spearheaded by Gold and the executive team, who have spent the last year attending events across four continents. With presentations such as Working in a Global Industry, France’s Circular Economy for Auto Recyclers, and my own wrap-up panel—Automotive Recycling Concepts from Around the World. ARA even hosted an International Networking Reception with representatives from Brazil, Canada, England, Poland, Australia, Japan and of course the U.S. Ten years ago, Canadians would have been in interesting novelty to the majority of ARA delegates, but now, Canada is recognized as a North American leader in the auto recycling field, with many commenting on how progressive Canadians have been regarding the adoption of standards, training, government and OEM engagement and overall promotion of the industry. In fact, three of the five ARA Executive Members have signed up for the big Ontario association meeting in Toronto in March—a reflection of the influence that Canadian Members are having within ARA and the overall industry. The ARA convention also saw the official launch of the Recyclers Mentoring Sessions - with recyclers hooking-up the event and pledging to be involved in each other’s businesses to help grow the industry and recruit the next round of industry leaders. Attending conventions are a great way to keep up on the ever changing trends, problems and opportunities, but when your peers step up and deliberately try to aid their fellow recyclers - that takes learning to another level. The overall event ended with dessert and fireworks that only Disney could pull off—a fitting end to a magical weekend that cemented Canada’s place as an innovator in the global auto recycling industry.